“AN AMERICAN writer has landed one of Scotland’s flagship literary prizes – with the first ever Gaelic science fiction novel. Tim Armstrong, a former singer in a Gaelic punk rock band, has scooped the Saltire Society’s prestigious “first book” prize with his book “Air Cuan Dubh Drilseach” (On a Glittering Black Sea). The debut from 46-year-old Armstrong, a trained biologist who is now an academic at the Gaelic college Sabhal Mòr Ostaig on Skye, features two musicians at the centre of the book’s plot. Armstrong, who was born in New York but brought up in Seattle, moved to Scotland 13 years ago and quickly immersed himself in the music scene in Edinburgh, where he formed a Gaelic punk band “Mill a h-Uile Rud”, which translates as Destroy Everything, while he was studying the language. Armstrong cites the late Iain M Banks and Frank Herbert as major influences on his writing, which has been championed by the independent Gaelic publishing firm Clar, based in Inverness. The judging panel for the first new book honour – which was first awarded by the Saltire Society in 1988, said of “Air Cuan Dubh Drilseach”: “Tim Armstrong has brought the counter-culture of his native Seattle to shape the first genuine sci-fi novel in Gaelic. Armstrong’s novel was one of two Gaelic books on the Saltire Society’s main shortlists for literary honours this year. 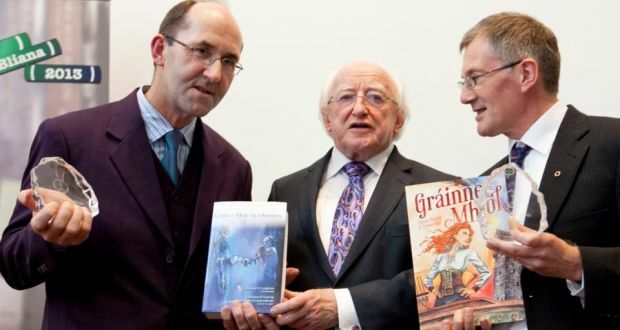 “President Michael D Higgins was in attendance to give the top awards to two books from publishers in the west: Leabhar Mór na nAmhrán, which won Gradam Uí Shúilleabháin best book in Irish for adults; and Gráinne Mhaol, which was awarded Gradam Réics Carló for the best publication for young readers. Connemara-based Cló Iar-Chonnacht have produced a bible of a book in Leabhar Mór na nAmhrán, the big book of songs, with 400 sean-nós songs from the four corners of Ireland brought together under one cover. Collected and edited by Micheál Ó Conghaile, Lochlainn Ó Tuairisg and Peadar Ó Ceannabháin, the book contains the complete text of each song with notes on who composed them and where they originated. Meanwhile, Mayo’s Cló Mhaigh Eo travelled the high seas themselves in search of Gráinne Mhaol, a full-colour graphic novel which tells the story of the famous pirate queen Granuaile. Mill a h-Uile Rud!? Seattle!? Cheers from Cascadia! Long live the Institute of Applied Piracy! Ah, the good old days…. Celtic culture and the PNW make me proud. Great to see an ex-pat back home. I’ll get there someday. Why on earth is Ireland mentioned here, this news is Scottish news. f Ireland. Len, the top part is about Scotland, the bottom part about Ireland, book publishing is the thematic link between both.